I enjoyed meeting with students from Dauphin County Technical School to discuss career and technical education. Local governments and recreation and conservation organizations can apply now for state grants to help pay for recreation and conservation projects. Department of Conservation and Natural Resources’ Community Conservation Partnerships Program grants benefit planning, acquisition, and development of public parks; recreation areas; motorized and non-motorized trails; river conservation and access; stream buffers; open space conservation; and regional and statewide partnerships to better develop and manage resources. DCNR has scheduled a February 27 webinar to help potential applicants. The 2019 grant application round closes April 10. State funding sources for the Community Conservation Partnership Program grants include: Snowmobile and ATV Registrations, Growing Greener Bond Fund, Environmental Stewardship Fund, and the Keystone Recreation, Park and Conservation Fund. For more information, visit DCNR’s Community Conservation Partnership Grant Program website. Legislation I introduced to ensure that public employees who commit job-related felonies are stripped of their taxpayer-funded pension was approved Tuesday by the Senate Finance Committee in a unanimous, bipartisan vote. The bill was also moved out of the Senate Appropriations Committee and now moves to consideration by the entire Senate. My legislation would require pension forfeiture if a public employee or public official is convicted, pleads guilty, or pleads no contest to any felony offense related to his or her employment. In addition, the legislation ensures that such criminal convictions are reported to state pension boards. Current law does not require the employee, courts, or state agencies to send copies of court records upon conviction. Instead, pension boards learn of pension forfeiture cases through agency websites and newspaper articles. Under Senate Bill 113, courts would now be required to notify state pension systems of all pension forfeiture cases. At a time when public pensions are wreaking havoc on state and school district budgets, it’s especially egregious that taxpayers are continuing to fund the pensions of public employees who commit felonies on the job. I appreciate the Senate Finance Committee’s support and look forward to Senate passage soon. The Performance-Based Budgeting process – measuring state spending against expected results – got underway in Pennsylvania last week. The Performance-Based Budgeting Board approved reports by the Independent Fiscal Office to grade the Banking and Security Department and General Services Department, as well as criminal justice agencies and tax credit programs. 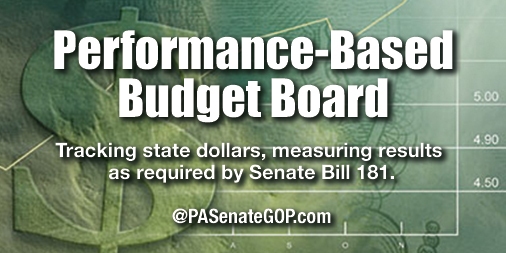 Performance-Based Budgeting was implemented as a result of legislation I co-sponsored, Senate Bill 181 of 2017. You can view the board hearings here. The Senate will reconvene Monday at 1 p.m. You can watch session live at SenatorDiSanto.com.